I love Stampin' Up! Not only are the products fantastic and great value, but they love to give things away too! 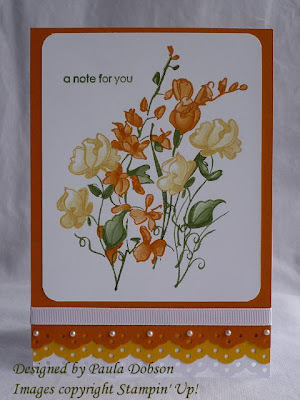 This card was made with a level two Hostess Set called "Echoes of Kindness", which you can get FREE with a qualifying workshop of $700.00. But you also get to choose $80.00 worth of any products in the main Catalogue also! What better reason do you need to host a workshop for yourself and your friends? Well, how about this reason...SALE-A-BRATION!! Customers: Receive a free Sale-A-Bration stamp set for every $120 purchase (no limit!). Hostesses: Receive a free Sale-A-Bration stamp set with a $700 or more workshop, in addition to the regular hostess benefits. Recruits: Choose any retail stamp set (a value up to $93.95) from the current catalogue when signing up during the promotion and it is yours FREE! This is a great time to host a workshop, there are so many freebies waiting for you to collect! Better yet - JOIN MY TEAM (Contact Me on the right side of my blog)and take advantage of a fantastic starter kit (valued at $655.00 - you pay only $379.00! ), 30% discount off your first SU order, plus another another Stamp Set valued up to $93.95. Oh my, that is so beautiful Paula. I'd never really noticed this set until you started using it. Just a stunning card! Your colouring is fabulous. Thanks for sharing.